When I think of the electric car I picture those pocket sized smart cars. The ones that seemed to elude that the carnie's forgot to pack up one of the bumper cars. 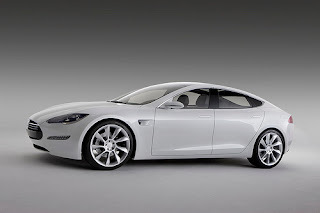 Thus refreshing to see electric car company, Tesla Motors, bring this joint to the market. 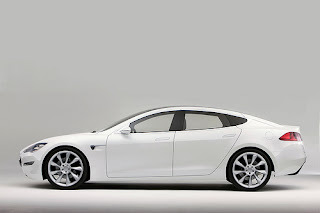 The model S will be coming to the market in 2011. 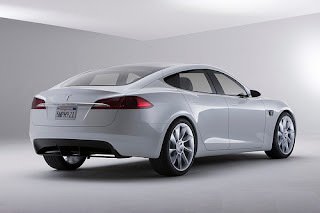 I guess what's more refreshing is the way in which Franz von Holzhausen overlooked nothing in the design. Not only does it resemble "the six-figure Maserati’s Quattroporte sedan and resemble the Jaguar’s XF sedan" it has an intriguing sweeping roofline, tail lights and the chrome trunk garnish all while rolling on 21-inch alloy wheels. The car has a 300 mile range on one charge, takes 45 minute to quick charge, 0-60 in 5.6 seconds, features a 17" infotainment touchscreen and seats seven. Base price $49,900.